Tel: 8 215161 37 Vandžiogalos g., Domeikava, Kaunas District while driving a car Driving down the street from the ruins of the Vandžiogalos, after passing the petrol station on the right, just before the village sign, Domeikavos rolling to the right. 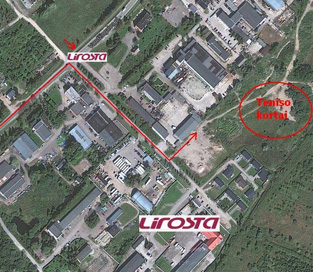 Just 250 metres away, for “Akvazoo” on the left side of the building, turn left into žvirkelį. 250 metres you should see white ovals, tennis course, building. If you are using a navigation system, enter the No.98, Dublin 8 g Vandžiogalos and you will arrive at the “Akvazoo” building referred to borders, for which on the left, you will see white ovals, tennis course, building. Travelling by public transport, you can reach Us by bus, the city on the route 23 and 54, micro-bus. Get off Vandžiogalos street stop, from which to the tennis courts is 500 metres away.